Dimensions: 3-15/16" X 3-15/16" X 7/8"
Dimensions: 3-15/16" X 3-15/16" X 5/8"
Dimensions: 7-15/16" x 3-15/16" x 7/8"
Dimensions: 3-15/16" X 3-15/16" X 3/4"
Dimensions: 6-15/16" x 6-15/16" x 7/8"
Dimensions: 7-15/16" x 3-15/16" x 5/8"
Dimensions: 6-15/16" x 6-15/16" x 3/4"
Dimensions: 7-15/16" x 7-15/16" x 5/8"
Dimensions: 9-15/16" x 9-15/16" x 7/8"
Dimensions: 7-15/16" X 3-15/16" X 3/4"
Dimensions: 9-15/16" x 6-15/16" x 3/4"
Dimensions: 9-15/16" x 9-15/16" x 3/4"
Dimensions: 11-15/16" x 8-15/16" x 5/8"
Dimensions: 13-15/16" x 9-15/16" x 7/8"
Dimensions: 13-15/16" x 9-15/16" x 3/4"
Window Cup Cake Boxes, Natural Kraft, 4" x 4" x 4"
Window Cup Cake Boxes, Natural Kraft, 8" x 4" x 2"
Dimensions: 8" x 4" x 2-1/2"
Window Cup Cake Boxes, Natural Kraft, 7" x 7" x 4"
Dimensions: 7" x 7" x 4"
Window Cup Cake Boxes, Strawberry, 8" x 4" x 4"
Dimensions: 18-15/16" x 13-15/16" x 7/8"
Dimensions: 18-15/16" x 13-15/16" x 5/8"
Window Cup Cake Boxes, Natural Kraft, 7" x 7" x 2"
Dimensions: 7" x 7" x 2-1/2"
Window Cup Cake Boxes, Strawberry, 4" x 4" x 4"
Window Cup Cake Boxes, Chocolate, 8" x 4" x 4"
Window Cup Cake Boxes, Chocolate, 4" x 4" x 4"
Window Cup Cake Boxes, Natural Kraft, 10" x 7" x 2"
Dimensions: 10" x 7" x 2-1/2"
Window Cup Cake Boxes, White, 7" x 7" x 2"
Window Cup Cake Boxes, Natural Kraft, 8" x 8" x 4"
Dimensions: 8" x 8" x 4"
Window Cup Cake Boxes, White, 10" x 7" x 2"
Window Cup Cake Boxes, Natural Kraft, 8" x 4" x 4"
Show off your cupcake creations with our Waterfall window cupcake boxes. These cupcake boxes are perfect for bakeries, coffee shops and grocery stores to display the unique and creative cupcake designs. American Retail Supply offers 9 different sizes to choose from and 4 different colors, Natural Kraft, White, Chocolate and Strawberry. At American Retail Supply our cupcake boxes are make from 100% recycled material, making them an environmentally responsible choice for eco-conscious companies. At American Retail Supply, we offer over 15 different sizes of cupcake inserts to insure safe transportation of all cupcakes. With 3 different sizes to choose from, mini, regular and jumbo, we strive to provide a variety of cupcake insert options that any bakery, coffee shop and even grocery store could choose from. 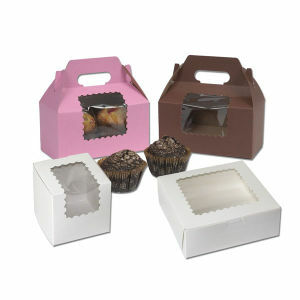 Our cupcake inserts are made from 100% recycled material, and are white on the outside with a Kraft natural interior. Cupcake Inserts are sold by the case, with 100 inserts per case. For product questions or to speak to a Product Expert,please contact American Retail Supply at 1-800-426-5708.